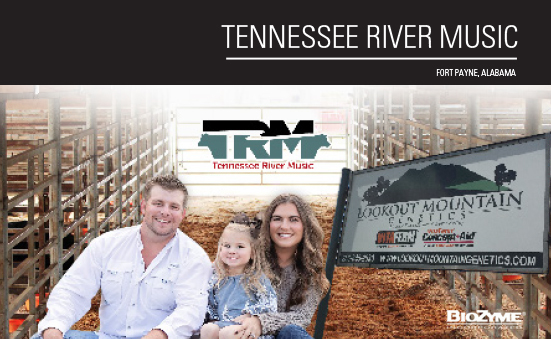 It is easy for Tennessee River Music to market and sell BioZyme® products. They have seen great success with many of the products on their own cattle enterprises, and John and Randa Starnes of Fort Payne, Ala. say the success they have had with the products helps sell them to other producers. “If we didn’t believe in the products we wouldn’t use them or sell them,” Randa says. John says they started selling BioZyme products nearly four years ago when they had seen positive results on their purebred Hereford and Angus operation. There wasn’t a dealer nearby, and the products they wanted were not always readily available. They decided to become BioZyme dealers so they would have the products on hand, and they could help other producers in the area secure a high-quality nutrition package. John says Tennessee River Music’s customer base covers about a 100-mile radius, with a few customers further out. John, who has a master’s degree in ruminant nutrition, wanted to provide a service to area cattle producers while having another venue to network with them. Adding BioZyme products seemed like a natural fit. John says the products really do sell themselves, and once a producer tries a particular product, repeat customers become the norm. At their bull stud, they put a 50 lb. VitaFerm® Concept•Aid® Protein Tub in each pen, something that bull owners from across the southeast take note of. He also says that this year, with the extreme heat and drought, the VitaFerm HEATTM mineral is a perfect fit for their operation. HEAT helps their cattle shed off, tolerate the midday heat and is fed to their spring calving cows that are bred in the summer time heat. Another favorite product is the Vita Charge® Stress Tub that John puts out for the first few weeks of weaning. He says these encourage calves to have a steady appetite, and in all the weaning seasons he has used them for, both the fall and spring calving herds, he has not had to treat a single calf for bloat or respiratory illness. One product that John and Randa have found fairly simple to market is the 50 lb. Concept•Aid Protein Tub. John says a couple of factors play into that product’s popularity. First, the average herd size in their area is less than 25 cows. The tubs are the perfect size for the smaller producers. Next, many farms in the area rely on the wife to take care of the livestock while the husband works off-farm. The 50 lb. size is much more manageable for a woman than a 200 lb. tub. And finally, the popularity of raising and showing goats in the southeast has risen in the past few years, and the 50 lb. tub is just the right size for goat raisers according to John. “Believe in the product you are trying to sell and know why it is better than brand X,” John said. It’s no secret that times are tough. Producers are constantly looking for ways to stretch their dollars. And luckily for them, BioZyme® is always developing new products with its producers’ best interests in mind while still utilizing its key ingredient, Amaferm®, in all products. 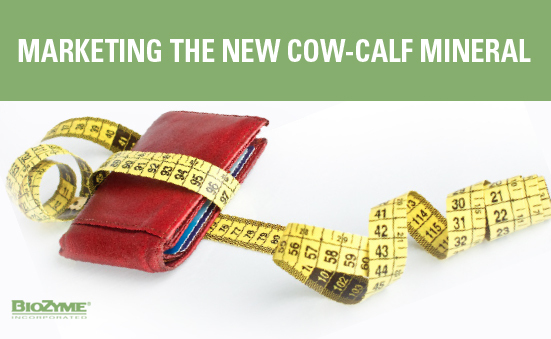 As BioZyme rolls out its new VitaFerm® Cow-Calf Mineral, producers will now have a lower-cost mineral option available to them during “belt- tightening” times or during times of the year when they choose to maximize savings. According to Lee, many producers will sacrifice quality to buy the cheapest product at a local farm or box store. And in the end, those producers discover they get what they pay for. While the new VitaFerm Cow-Calf Mineral does not contain the same level of vitamin and minerals as all other VitaFerm mineral products, it does still exceed NRC requirements. The big ticket to marketing the VitaFerm Cow-Calf Mineral is to remind customers they will still see the Amaferm advantage when using this product. “Producers can keep their cows on Amaferm at a lower price point,” Lee said. 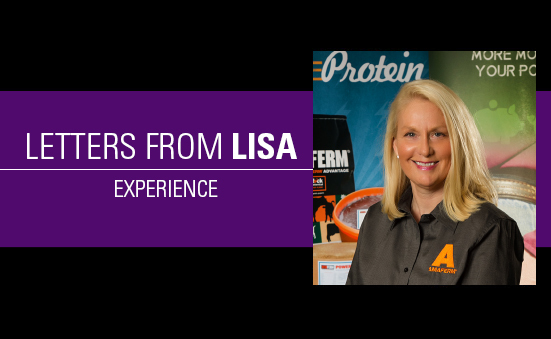 Lee encourages producers to continue feeding VitaFerm Concept•Aid® during the critical times of production like breeding and prior to calving to get the most return on their investment. However, he says due to the Amaferm being included in the lower cost mineral package, producers should still see increased appetites, initial gain and increased feed conversion from VitaFerm Cow-Cow Mineral in the down time. The introduction of the VitaFerm Cow-Calf Mineral to the BioZyme line of products is a good way to capture new customers, according to Lee. He encourages dealers to find those producers who have been buying the $18-20 bags of mineral from competing brands and introduce them to this mineral and the Amaferm advantage. He says once they try this mineral, and see some small results, they are likely to try some other products, see big results and be hooked on the BioZyme products. He also recommends marketing this to less-progressive producers who don’t demand great results immediately. Lee adds that the price point of this new mineral option makes it a great product to have on hand, so fill the truck with it to take advantage of better freight rates. “All dealers have those price conscious customers. This is a good product to put before them, but remind them, they do get what they pay for,” Lee said. Listening to his customers’ goals and watching them learn from their experiences are two of the ways that Don Bush, manager at Powell Feed and Milling, tries to help his customers minimize expenses and maximize their profits. As a BioZyme® dealer in north central and northwest Arkansas, Don tries to use the proactive approach of reaching out to his customer base and identifying their needs. “We try to get on the phone with our customers as much as possible to find out their goals and understand what they are trying to accomplish with their operations,” Bush said. They have an outside sales person who also tries to get to each of their eight retail locations weekly to maximize personal contact with the customers as much as possible. The first way that Don helps his customers maximize profits is with one of his most popular products, the VitaFerm® 30-13% Protein Tub, which he says his customers appreciate as a complete mineral package. Don says he is excited to market the new VitaFerm Cow-Calf Mineral as a second way to help his customers maximize their profits with a lower-cost option that still offers the Amaferm advantage. When his customers chose a lower-quality product, their cattle don’t perform to their expectations, and they soon realize that the Amaferm advantage saves them money in the long run. Bush notes that there are multiple ways a complete mineral package saves producers money over time. 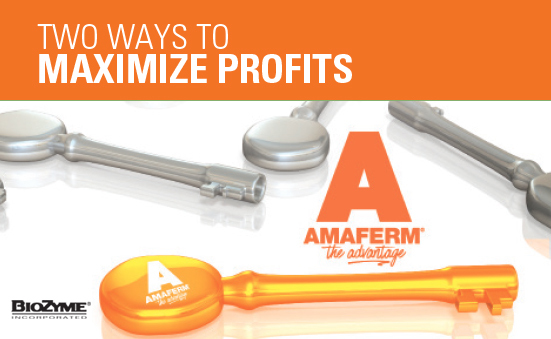 With a product like Amaferm, producers see increased appetites, increased gains and more productive cows that breed back more efficiently. He adds that a good nutrition programs keeps calves healthy, which lowers vet and animal health bills. As most of you know, BioZyme® has been around for quite a long time. I would say its “old” but since my birthday is in December, and the mirror seems to think I am getting “old”, I am just going to say this company has had a lot of experience. Author Aldous Huxley states that experience is not what happens to a man: it is what a man does with what happens to him. BioZyme has tried to live through all of this experience by staying focused on innovation, research and outreach that positively impacts the performance of animals so their owners succeed. Our team tried hard to keep that theme going in 2016. See what you think. Installation of comprehensive small pack manufacturing capacity, allowing us to manufacture all of our Vita Charge® and Vitalize® pastes, liquids, powders and gel caps in-house. This allows for much quicker turn around for these very fast growing lines of products. More loading and fulfillment space for faster order turn around. Faster and increased manufacturing capacity with the installation of the Italian-made Concetti completely automated bagging process. This technology can handle pellets, mash, bran, granules, flakes, or crushed product bagged through a completely automatic IGF bagging machine, capable of reaching a capacity up to 1,200 bags per hour. Our old line could accomplish 2,000 bags per 8-hour shift. A new, more interactive Online Dealer Center to allow for the addition of more useful features for growing and tracking your business. A new VitaFerm® Cow-Calf Mineral that addresses the nutrition minimums of a cow and her calf at a price that is sensitive to the current market challenges without losing the Amaferm® advantage. Adding cool, relevant folks to our team so we can make a difference in the challenges faced by this great industry. A two-year study at The Ohio State University found that cattle fed Amaferm during the first seven days following feedlot arrival, the highest stress period in the feedlot, had double the average daily gain and feed efficiency over the control group. Research completed in Germany at Christian-Albrechts-University determined that BioZyme’s AO-Biotics™ reduced gut leakiness, protected against infection and tissue damage and supported up to 30% more absorptive capacity of nutrients to the monogastric animal. A controlled field trial completed at the University of Tennessee-Martin found cattle given Vita Charge Drench upon arrival recovered more quickly, shown as a significant increase in weight gain during week one. The control cattle actually lost weight during the first week. Those drenched cattle were also fed the Vita Charge Stress Tub for 21 days. This combination resulted in a significant starting advantage during weeks 1-3, but also maintained the advantage throughout the trial, with significantly better ADG and weight gains in weeks 4-7 and 1-7. Secured being the authorized partner with Superior Livestock Auction, offering the first-ever and 2017 exclusive value-added nutrition programs. This is a HUGE outreach opportunity for all of us that love our amazing products. No other company has this distinction. Not Purina, not Nutrena, not Kent and not ADM. Go get ‘em, team! Started the Feed the Future Program with the Hereford Youth Foundation of America to support youth – the future of our industry and our country. Sponsored the Junior National shows of 12 cattle breeds and the World Pork Expo, allowing more than 4,000 youth to spin the Sure Champ® wheel and answer nutrition questions to earn prizes. Transported numerous injured war veterans to their necessary medical visits around the country. Pretty amazing, don’t you think? I am giving you a large bear hug right now. Why? Because you are part of the team that made all this happen. Because you are amazing. I hope you have a blessed Christmas and a very Happy New Year. My sales team would be disappointed if I didn’t end the year with a challenge. How many tons will we be able to sell if we find all the amazing strategies to make a difference for producers and animals? I hope it’s a number we can’t even imagine.